Claudette's Travel Journal Blog is now closed, and has been almalgamated into the main family blog. The latest travel itinerary is up at: http://www.jamesworld.ca/list It is a published Excel spreadsheet with tabs at the bottom to view different sheets. 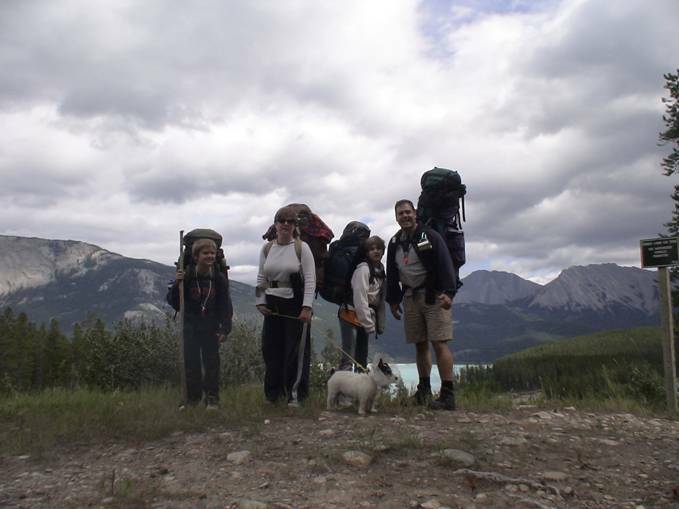 This picture taken on our family Cline River (Alberta ) hiking trip in August of 2006. Claudette’s job offered their staff a year off from work every four years, and Rick’s industry (Surveying) is very robust these days so, we decided to take a year off and travel around the world. (Especially since her job will be waiting for her and it will be easy for Rick to find full time employment again. As far as the kids go, agh well! Life is too short to rush through school so they’ll both miss a year and be one grade back once we return. ). The biggest difficulty in trip planning of course is limiting ourselves in which countries we can aspire to try and visit and explore. We started off by each of the four family members picking several countries they were interested in visiting. From there we created a rough itinerary, and that evolved to what is on out list today. We have to book our airfare in portions since tickets are usually only valid for one year. Travel VISA’s for various countries are also valid only for a few months from the issue date, so we can only plan so far ahead. We are hardly wealthy people but have saved a bit over the last few years. We’ll also be tapping into a few lonely RRSP’s and trying to be frugal along the way.